At last count, there were 20 MILLION more cellphones than people in the United States… and 3/4 of those polled…75% – say that people using cell phones have gotten ruder and ruder over the years. People using cell phones are clearly paying more attention to the people they are talking to than to basic manners and civility. Use of cell phones in public places like movies and restaurants are problematic. 55% of those surveyed said they have felt uncomfortable having to overhear a private conversation… made worse by the fact that findings have shown that the average person speaks three times louder when talking on a cell phone than they otherwise would. 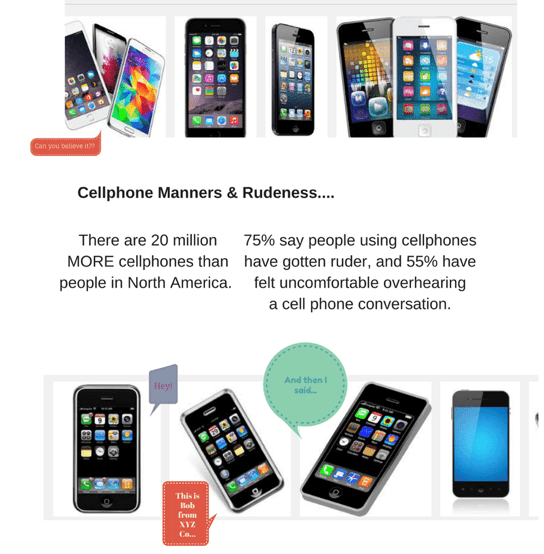 Most people report that they themselves have excellent cell phone manners…but are disturbed by everyone else! You never forget your cell phone every time you leave the house…do you need a reminder to remember your manners too?